We no longer offer this product, we have something even better to meet your needs. Find it here . Is HL2 right for me? 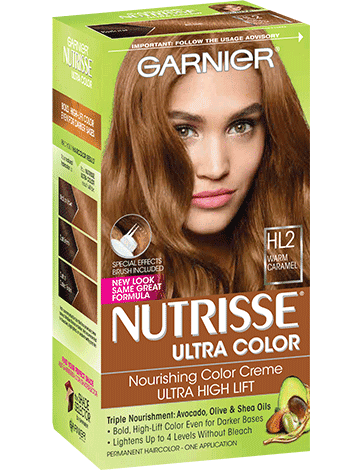 Garnier Nutrisse Ultra Color HL2, "Warm Caramel" was specially designed for women with the darkest natural hair who are looking for dramatic lift. It can lift up to 4 levels without bleach and creates a warm, golden brown result. The kit also includes a custom applicator tip to help with all-over application or to help you create special effects. HL2 is for you if you begin with darkest brown to medium brown hair. If your hair is naturally black, HL1 might be better for you. We do not recommend HL2 for bleached, highlighted, or predominantly gray hair, due to the lifting ability of this shade. Rated 2 out of 5 by Thegirlwholikeschocolate from It's ok but.. I dont think this color suited me. That's ok, & I seen this at the 99 cent store today. If anyone is interested. I miss ultra color B1 cool brown but you guys discontinued that :( Please bring back Ultra color B1 cool brown back. Please.. Rated 5 out of 5 by Adar from Disappointed for being discontinued This was the only product that I have ever used that worked perfectly for my medium/dark brown hair. The color was a beautiful gold, warm caramel. Could you please tell me what other color is similar to this one? Rated 5 out of 5 by Ksrobins77510 from Excellent Coverage Absolutely love this color, I have a lot of gray's. This make my hate so soft and beautiful. Will not use any other color or brand. I am your #1 fan. Rated 1 out of 5 by Krazee1006 from Didn't work- disappointed I bought the ultra color in warm caramel so I could lighten my hair. I chose this because it is specifically meant floor medium brown to dark brown hair. I followed the video on the website to do balayage style to my hair. After rinsing and I have are lightened roots and that's it. Nothing else happened. While I am happy with the color of my roots, I'm not pleased that that's all I have. Rated 4 out of 5 by Ciaratocute from My best friend for my hair . My favorite hair is streaks, mostly was straight for the day . I love to use really curling irons and use serum . I like to use decide hair gel . Rated 1 out of 5 by Booboogirl from No difference! Bought this today. Was super excited. I used it and no joke my hair is darker. With alittle reddish hue to it. Now debating trying to lighten it, due to my disappointment. Rated 1 out of 5 by Adrianamariae from Not the hair color expected I just used a product that was suppose to shade my hair lighter and it is especially for darker hair and I did not see a difference. Rated 5 out of 5 by JeniVW from Beautiful Lightening Effect! My hair is naturally a moderately-dark brown and I wanted to go lighter. I had a few grays to cover, too. I decided to try the Warm Caramel color. It was very easy to apply with the applicator tip/brush. I have very thick, somewhat curly hair that falls below my shoulders, but 1 box was plenty of color. The end result was a warm brown with strawberry tones, and the product made my hair very soft and covered my dark roots completely. It's the easiest and best at-home coloring kit I've ever tried!